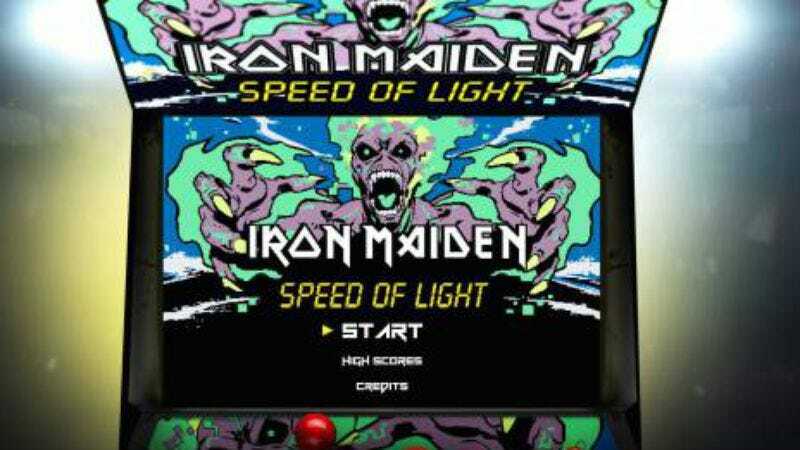 In the video for Iron Maiden’s new song, “Speed Of Light,” the band’s mascot Eddie The Head shows up in various styles of video games based on famous Iron Maiden album covers. Run To The Hills is a fighting game, Somewhere In Time is visualized as a side-scrolling shooter, Killers is now a Donkey Kong-style platformer, and so on. If the footage shown in the video is the arcade version, then the new playable Speed Of Light is the cheaper NES port with graphics that just aren’t as good. In the free game available on the band’s website, the player takes on the role of Eddie, who must travel up ladders, avoid rolling barrels, and rescue the princess from the big bad. (However, since this is a game based on the music of Iron Maiden, the princess is a redhead clad in a skimpy dress, high heels, and thigh-high stockings.) Players climb ladders, avoid obstacles, and attack the villain with television sets, life preservers, refrigerators, and a hatchet. The levels progressively get harder, with the building growing taller and taller with each level. The soundtrack features an 8-bit style recording of the tune “Speed Of Light” from the band’s newest album, The Book Of Souls. It’s a fun time-waster, even for those who prefer Jim Dickinson to Bruce Dickinson. The Book Of Souls comes out September 4th.